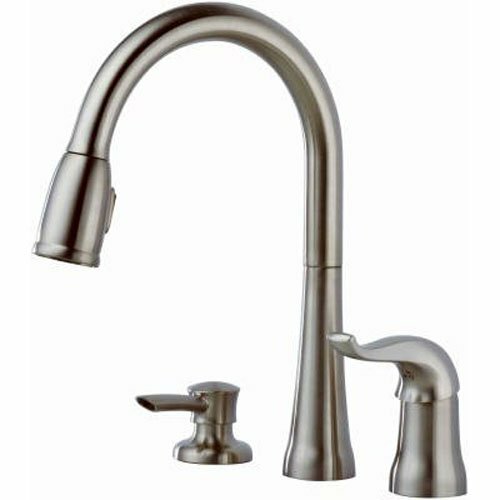 With a lifetime warranty, this Delta model is the perfect faucet for any kitchen. It has a modern style and excellent water flow. 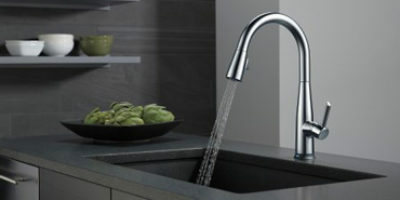 If you have a sink that has three holes, then this faucet will fit perfectly in your kitchen. 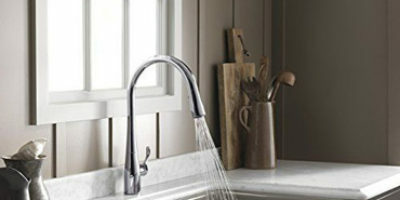 The Delta 16970-SSSD-DST Kate faucet is really easy to be mounted and you can do it on your own. 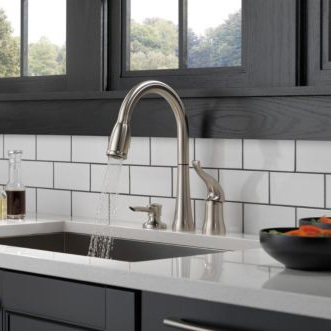 After you do it, you’ll have a great modern faucet in your kitchen that looks amazing. The spout is able to move for 360 degrees which is excellent if you want to use it for more than just quick washes of your dishes. along with the hose, you’ll be able to do a lot more. The hose is flexible and is 20 inches long which is not spectacular but together with the rotating spout, you’ll be able to do a lot around the sink – wash dishes, fill up bowls or bottles or wash some fruits or vegetables. There are no sensors, or touch systems which means no batteries, no power problems, and complex installations. Everything is controlled from the handle – the water flow, the stream and the temperature. The handle is installed in one of the holes and looks very stylish. When you turn the water on and you want to use the hose, you can use the spray head to change the stream and to pause the water flow. Most of the things are operated with the handle but the spray head button is also something that will provide you a great deal in your time at the kitchen. The spray head and the hose are easy to work with but everyone likes to know if the docking system works well after the work is done. The Delta faucets are using the MagnaTite system for docking the hose back to the spout. Many models are using this unique system that feels amazing and works perfectly every time the user is finished with the washing. Two streams are available that can be changed from the spray head. The standard stream and the spray flow that’s excellent for water washing your food. The spray holes in many faucets get stuck over time, but Delta is using a touch clean technology that allows you to clean them with only a single touch of your fingers over them. This way you’ll never have to worry about this problem. Being a three-hole faucet, we can say that the design is more than modern. After installing it, you’ll feel like you’re using a kitchen of a fancy hotel room. The design is modern and will fit in modern interiors but you can be sure that more traditional kitchens won’t feel strange too. One hole of the system is for the spout, one is for the faucet and one is for the soap dispenser. The soap dispenser comes in the set and is made beautiful and fits perfectly with the rest of the faucet. The handle, the dispenser and the spout all have a different design line but put together and ready to be used, they look amazing like one piece. This faucet is made of metal. There are two available finishes – chrome option that looks like standard chrome and a brilliance stainless which looks really amazing. Water and fingers will leave no trails and your faucet will always look clean and shiny. Of course, it’s a matter of taste and some people prefer more the chrome option which looks great. The spray head is also something special. From it, you can control the water flow and the hose. The hose is 20 inches long and follows the same color and style as the rest of the faucet materials. The length is not impressive but you can still use it for some more complex tasks around the sink.